I have a diffusa specimen that I have had for 30 years now and it is about 4 1/4" in diameter! When a friend gave it to me all those years ago, it was about 25mm in diameter. It produced four pups nearly a year ago, but they are showing signs of rot and one has already turned to mush. Is there any way to halt this disease before it gets to the parent plant, or is it already too late. I would hate to lose it after all these years. it has always been healthy snd flowers several times a year. Arrrw, that's a bad situation. If the plant is rotting the only advice I know of is to cut out the affected tissue - if the rot has spread to the roots you need to remove the plant from the soil and remove the affected roots also. Anyway, you need a sharp knife to cut out anything that isn't firm and clean. When the cut surface appears healthy green (greenish white for the cortex) then sterilize the blade and cut off an additional sliver of tissue from the cut surface. Finally dust the wound with sulfur or some other disinfectant (I've used a concentrated food preservative containing sodium benzoate, effectively killing most yeasts, bacteria and fungi. In Europe it's sold under the brand name Atamon - I don't know if this brand is available elsewhere) and keep the plant dry and warm for several weeks until the wound callus over. My personal success rate with this kind of treatment isn't high - probably because I'm unwilling to maim the plant and consequently don't get all the bad tissue removed, but I sincerely hope your plant survives and am interested to hear how/if the plant copes. 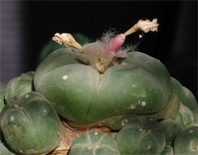 Probably the best Lophophora info-source on the net !Continue ,I am looking almost each week!